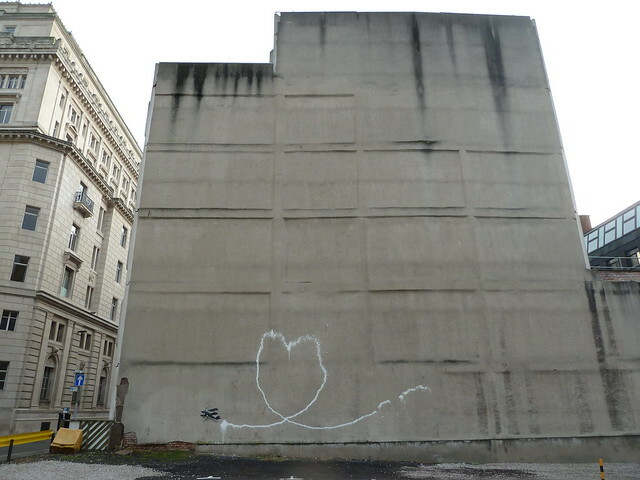 Another year, another Banksy, at last! 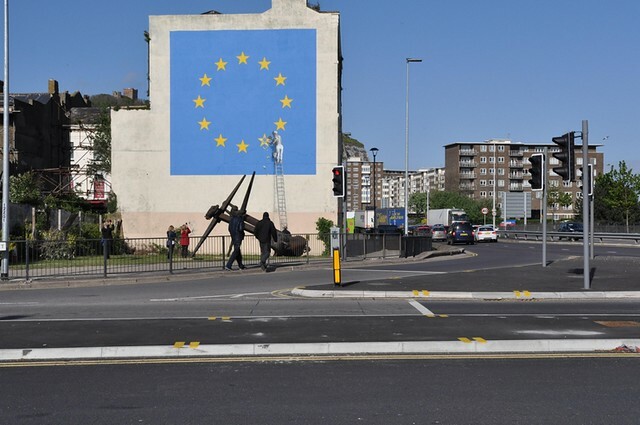 The port of Dover, the continent’s gateway to the UK, found itself the proud home of the latest outdoor street art masterpiece by Banksy. 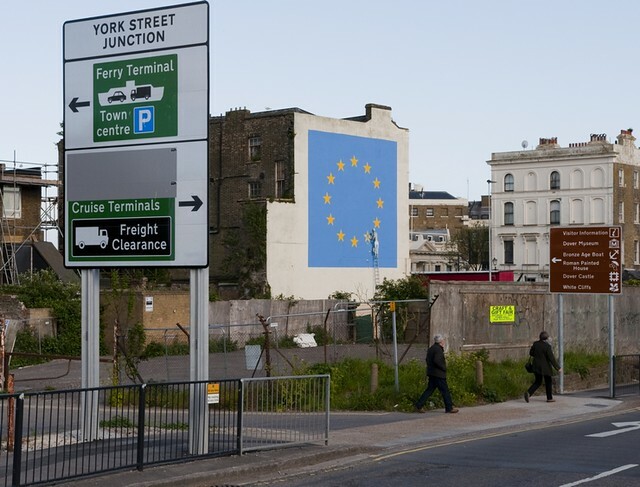 A huge version of the EU flag with a worker chipping away at one of the 12 stars greets inland arrivals coming into the port on the main road from London. 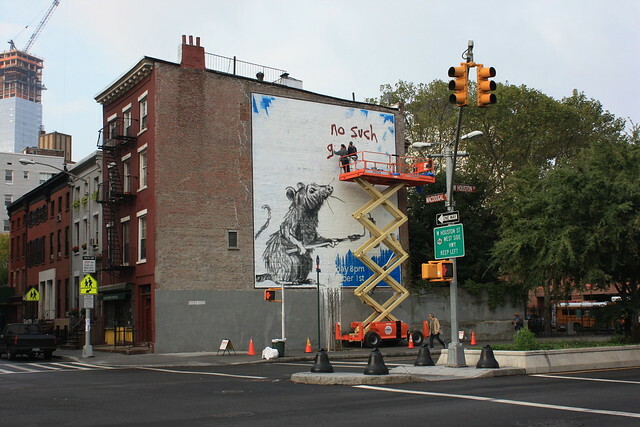 The work is classic Banksy in so far as it is political and humorous, it is on the street and it is topical. It is also superbly executed, both in its large scale and in its minor details. When it reveals itself to you from about ¾ mile away on the hill descending into Dover, its audacious scale and visibility is quite breath taking. This isn’t tucked away on a back street facing somewhere anonymous, you simply can’t miss it (didn’t get a photo of that view – concentrating on driving and not interrupting the massive flow of British trade to Europe on all those lorries). I’ll wager by the end of this year this could be one of the most viewed single works of art in the country, perhaps even the World [subject to it lasting a reasonable length of time]. Graffiti and street art is all the more impressive when the key question “how the hell did they do that?” comes to mind. 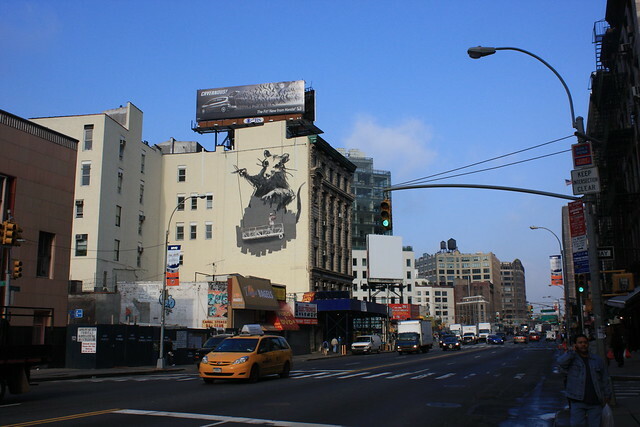 One possibility here is that Banksy might have commissioned a third party to execute the painting based on his concept and sketches, this was the technique he used in New York in 2010 when a company called Colossal Media were contracted to paint four massive Banksys, photos below from my great friend in NY Luna Park. Another possibility would have been to project the image onto the wall then paint using the projected image as the guide. The straight edges of the flag are so crisp and straight and to the naked eye appear perfectly horizontal and vertical so this wasn’t hastily knocked up in a few quick minutes up a ladder but using a projector would have meant painting in full view of passersby which is hard to imagine Banksy doing. There are reports of reports on social media that scaffolding was seen against the wall suggesting that the same method used to paint “Shop Till You Drop” just off New Bond St in London was used. Basically crew set up scaffolding, wrap tarpaulin around it, Banksy (presumably) works anonymously shielded from the glare of public view and after he’s done and left, down comes the scaffolding et voila! (It’s important to slip some French into this post). The subject of the work is clear, it’s about Britain leaving the EU but is the piece perhaps a bit ambiguous? Is the worker a “Leave” supporter taking great delight in symbolically destroying the EU or are his actions showing us how devastating the course the UK is seemingly irretrievably embarked upon is, in other words pro-Remain. 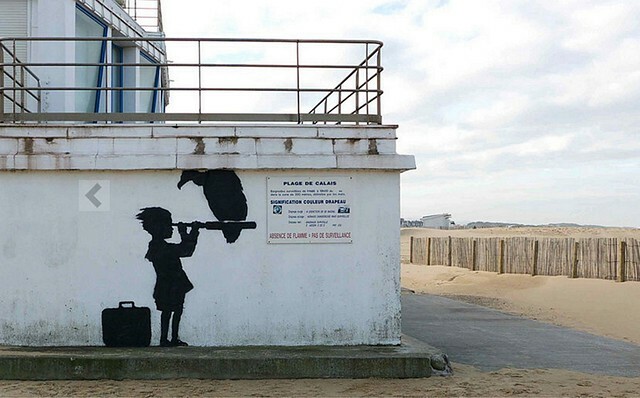 Context is everything with Banksy and his views are pretty clear if you think back to art he put up in Calais in 2015: Steve Jobs as an immigrant; a child gazing through a telescope across the channel to England but a vulture (death) perches on the telescope; and his “We’re not all in the same boat”, a raft borrowed from “The Raft Of The Medusa” by Théodore Géricault gets blanked by a passing superyacht. 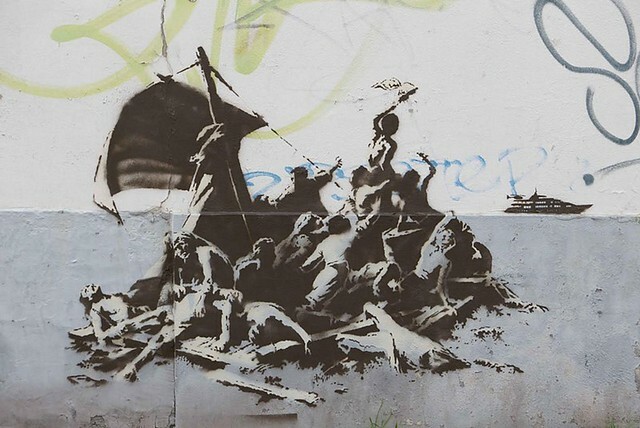 The issue was the refugee crisis but the message was "more humanitarian compassion" meaning open boarders, Banksy is pretty clearly pro EU. 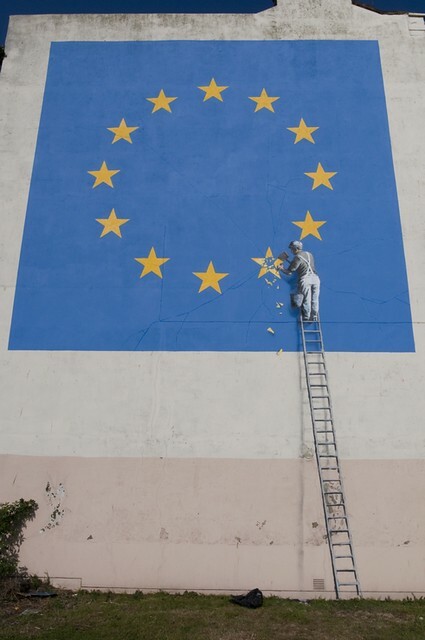 Ironically this new work is not a representation of one country being removed from the EU flag as the stars do not represent individual countries. Leaving aside theories of the occult and paganism, the stars are arranged in a circle to represent unity, a unity which is being shattered by this worker. Timing is a bit of an issue since the decisive vote which lead to our latest Prime Minister changing her mind completely from “remain” to “a red, white and blue Brexit” was 11 months ago. Brexit is central to our current general election process but only to the extent that the PM seeks a mandate to do as much damage as she can without subsequent recourse to the population. 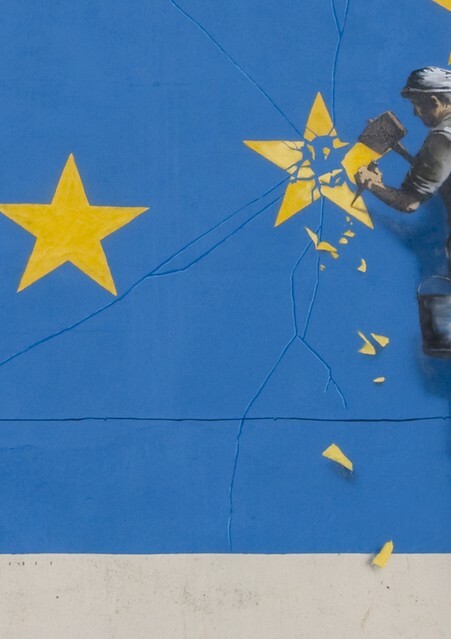 Banksy’s mural seems to be more timely if considered in the context of the French presidential election which reached its climax this weekend as the eminently sensible French electorate chose a centrist pro EU president rather than a far right candidate hell bent on wreaking further disunity and harm to the EU. “Electorate”, “Sensible” and “French” appearing in the same sentence, wow! 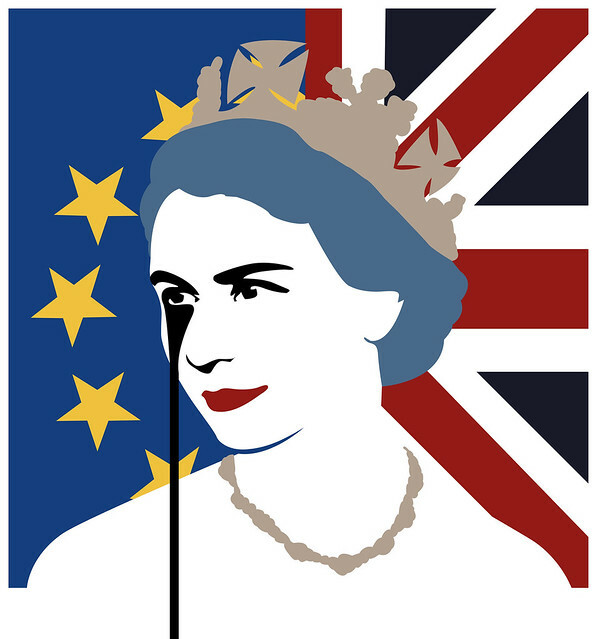 It must also be said that the Brexit result inspired quite a tsunami of “remain” orientated Brexit art, including ones with similar ideas of missing stars in the EU flag. The placement of this piece is magical. Dover is defined in its present and its history by this country's relationship with the continent, whether that means trade, migration, vacation or war. Almost no one passes through Dover without registering that this is a point of departure, arrival and communication and it is all about the short cross sea link to France. It is hard to imagine a place in the UK where a Brexit piece could resonate more with its surroundings. Although the art is unsigned we can confidently attribute this to Banksy as photos of it have now appeared on his website. To digress for a moment, I scoffed initially when news outlets said Banksy had posted a photo on his official instagram account as Banksy doesn’t do social media but I just noticed his FAQ page says “Banksy is NOT on Facebook, Twitter…”, no mention of instagram. 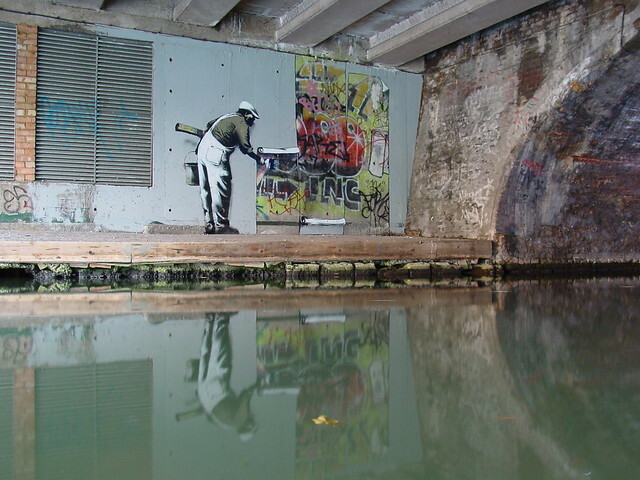 Some of the elements of the composition are vaguely familiar from previous Banksy works. The workman dressed in dungarees with a bucket echoes the wallpaperer in Banksy’s famous provocation of Robbo back in 2009. 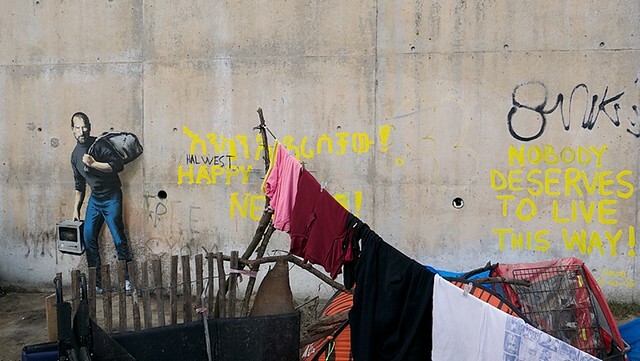 The ladder echoes the ladder Banksy painted on the Palestine wall although that was meant to be a childlike chalk drawing of a ladder, not the elaborate drop-shadowed two coloured ladder in Dover. 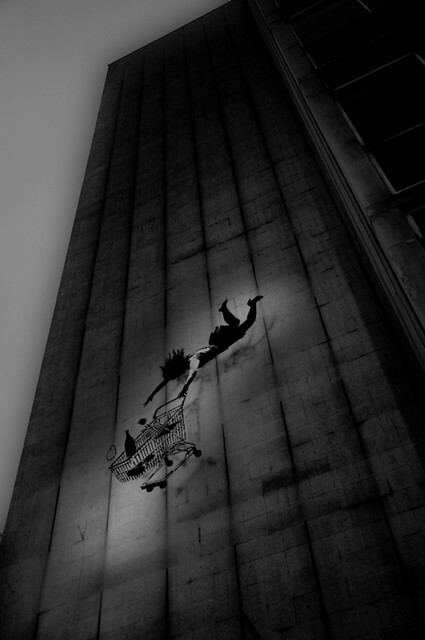 The clever drop shadowing of the crumbling stars elegantly lifts those falling fragments away from the wall, rather like the shadowing you can see Banksy employing in “Shop Till You Drop” above. 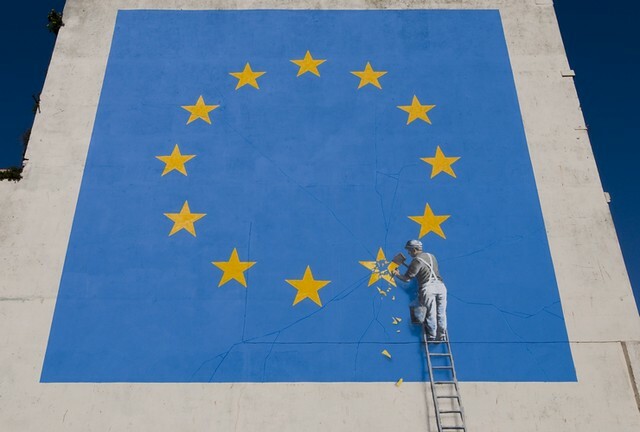 Early reports of this new work came from The Guardian and the BBC’s website, it seems that these two institutions have a very reliable inside track on new Banksy scoops. The news broke on Sunday, coincidentally at the same time my wife and I were down in that part of the world staying in Rye and visiting Dungeness. Just over a year ago I used someone else’s “bad science” to prove I was Banksy. Someone else came up with the theory that either Robert del Naja or indeed the whole of Massive Attack are Banksy; now I am not Massive Attack and I am pretty sure I am actually not Banksy either. However, in December 2011 we went en famille (bit more French there) to Liverpool for a QPR away game and lo! the Love Liverpool airplane appeared that day. Coincidence again? Or is my wife actually Banksy? Ha! Didn’t see that coming did ya? If I find any dodgy APs (artist proofs) of early print releases, I’ll let you know via the usual channel – eBay.